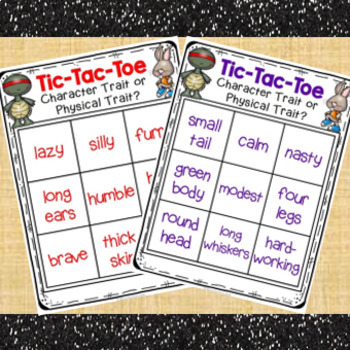 Engage your students with these fun and interactive Tic-Tac-Toe games for the fable, 'The Tortoise and the Hare.' 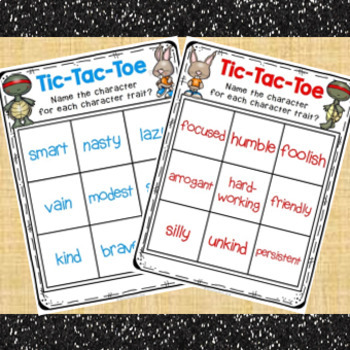 These Tic-Tac-Toe games are perfect for reviewing character traits, physical traits, positive traits and negative traits! 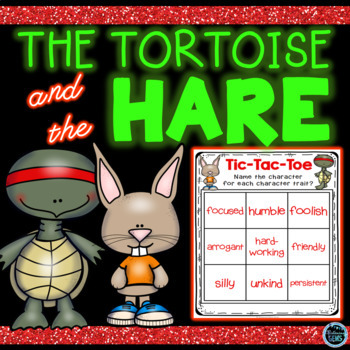 The Tortoise and the Hare activities will enable students to make inferences about the characters in the Aesop's Fable. 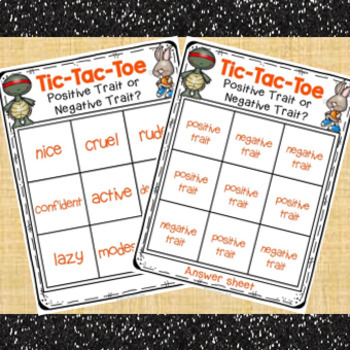 These Tic-Tac-Toe games can be played as a whole class game or in pairs. Great activity to incorporate into your literacy centers, guided reading lessons or literacy groups! Game 1 & 2 - Character trait or physical trait? Game 3 &4 - Name the character for each character trait. Game 5 & 6 - Positive trait or negative trait? Game 7 - Blank template for student to create their own game. Simply print and laminate the Tic-Tac-Toe game boards onto hard card stock paper for durability. Please see the preview to see a snap shot of the product.